What better way to explore the idea of beautiful lines than with Oceanic art. Oceania is a vast expanse of the Pacific Ocean that covers one-third of the planet's surface. Contained in Oceania are the countries of Australia and New Zealand, and the geographic regions of Melanesia, Micronesia, and Polynesia. 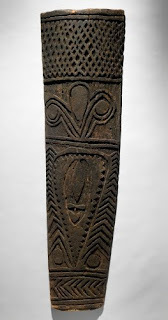 Let’s look at some art from Papua New Guinea in Melanesia. The geographic region of Melanesia includes New Guinea and islands that extend east as far as Fiji and New Caledonia. About 27,000 years ago, people from southeast Asia settled the islands north and east of New Guinea. By between 4000 and 7000 BCE they were farming and raising livestock. 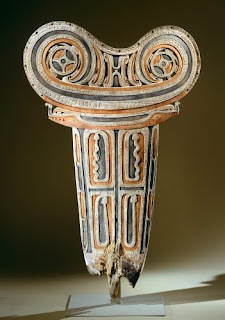 Archeologists thinks that a culture called the Lapita settled the rest of Melanesia. The extent of their colonizing and even their origin is not known. New Guinea is divided between Irin New Guinea (part of Indonesia) and Papua New Guinea. The island is the location of one of the largest groups of diverse cultures and artistic expression in Melanesia. It is a prolific region of artistic expression. Sculpture, painting, or carving adorns almost every object of secular and ritual life. By adorning every object in everyday life with art, it has been traditionally believed to bring the world of the spirits into activity with the world of humans. The implied lines in the sculpted features of this prow ornament combine with the painted lines to create a dynamic, complex, and sophisticated art work. New Ireland is in the Bismarck Archipelago, located north of New Guinea. Today it is a province of Papua New Guinea. In New Ireland, large figurative sculpture is rare. Canoe prow figures are among the largest. Usually when the human figure is involved, the head dominates the composition. Traditionally, such figures would be attached to the prow or stern of a canoe. Even children's canoes have sculpted prow figures for speed and protection. The island of Papua New Guinea is rugged and canoe is the main mode of transportation. These prow figures are elaborately pierce-carved and painted in traditional colors of red, black and white. The bird and animal forms surrounding the human head represent ancestors of the canoe owner's clan who serve as protection, speed, and success. The Kwoma People of the Washkuk Hills have traditionally been part of the unique rituals that are centered on the cultivation of yams. Feasts and rituals were organized yearly to celebrate the events around the harvest, and to ensure the edibility and purity of the yams. The sculpting of giant heads is part of those rituals. The sculpting of wood is considered a task that ensures that the object created is a suitable dwelling-place for ancestral and natural forces. Shields such as this, which protect most of the holder’s body, were often produced to be displayed at shield feasts during the yam festivities. The parallel chevron lines in the center of this shield frame a face representing a protective family spirit. The Abelam are members of the Sepik language group. They are a farming society also involved with the cultivation of yams. 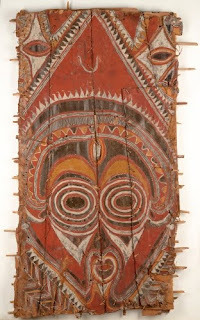 Like many of the peoples in Papua New Guinea, traditionally much of their ritual life has been connected with spirits (ngwalndu) who temporarily interact with human beings. The korumbo (or kurambo) is a ceremonial structure, not really a meeting house, meant to lodge the ngwalndu on their visits for ceremonies that celebrate certain stages in the lives of men and women. The rich artistic expression of the Abelam is dominated by expressive painting. Paint was traditionally viewed as a mystic substance that endowed sculpted images of the spirits activity and power. During initiation ceremonies for young men, artists would carve or paint images of ngwalndu in order to ensure their presence and participation. The concentric lines painted around the eyes of this spirit make it a particularly expressive force. The Egum Atoll is home of the Massim people who live among the Trobriand Islands. The Massim culture covers an area of about 300 miles southeast and southwest from Milne Bay. It includes partially-submerged mountains and archipelagoes. One of the central cultural events among the Massim is the act of ceremonial gift-giving (kula) between islands. Carving and decorating canoes is a large part of the kula. The red paint is actually a trade item in the kula, secured from Dobu Island, because it is made from an earth pigment not found in the Trobriand Islands. The canoes contain ornately carved and painted splash boards on both prow (rajim) and stern (lagim). The rajim not only protects from the splashing of the waves, but is endowed with spiritual power to protect the canoe occupants and ensure a successful kula. The upturned volutes at the top of this board are supported by two bird heads, with two pairs of snakes indicated in relief below. The small holes around the edges were meant to accommodate stringing of seashells as ornament. The white pigment was made by heating sea shells and crushing them into powder, while the black pigment was a mix of charred coconut and banana stalk sap. I know New Zealand is part of Polynesia, not Melanesia, but I couldn’t help including this gorgeous example of line. Unlike Melanesian cultures such as Papua New Guinea, the Polynesian cultures such as the Maori have not traditionally had such as broad range of art forms. Carved and inlaid wood dominates their artistic output. The incised lines in this work imitate the tattooing of the face. The spiral is a central motif in Maori tattooing and sculpture. 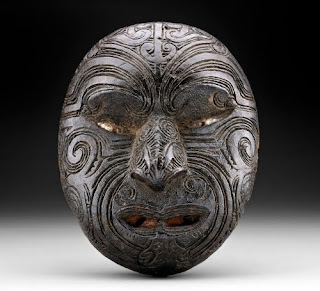 It is thought to have been influenced by the abstracted bird/human design called manaia that decorates many Maori art works. 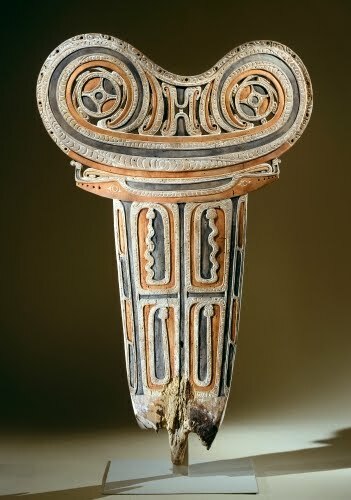 The spiral motif, like the Chinese tao-tieh decoration of the Shang period, may have evolved from interconnected, split, and flattened manaia patterns. Traditionally, ancestral skulls were mummified and decorated as veneration of the deceased. This example may be a substitute for a damaged skull, or, it may have been part of a bird perch, a net holder, or a canoe ornament. 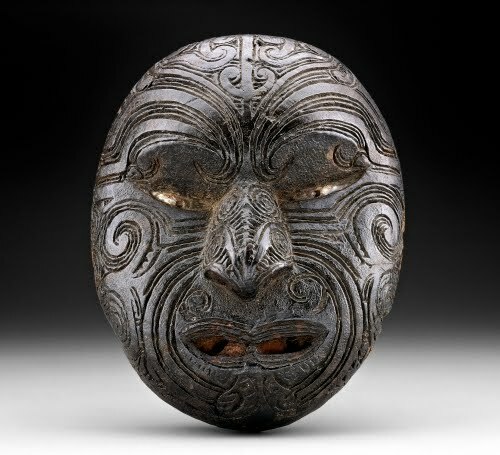 Masks were not worn in Maori culture.